“I had an invaluable transformation in my life after becoming organic farmer and integrating farming activities. Although I was not using chemicals much yet after using 100% chemical free farming inputs, the production cost reduced substantially and savings increased while farm yield improved so the profits. Secondly change takes place by four modes – observing, hearing, reading and self-learning. Through the combination of these four ways I came up in life. 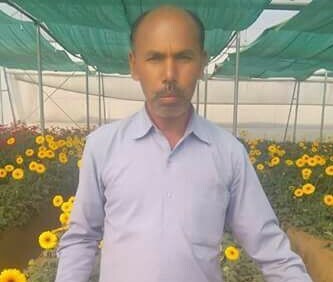 I became a self-supporting organic farmer from a farm labourer,” asserts Mr. Gasu Mehta, progressive farmer from Sadma village, Ramgarh district, Jharkhand. Once he earned Rs. 50/day but now he earns Rs. 3-4 lakh/month! His farm spreads in 14 acre. More than 10 varieties of seasonal vegetables, watermelon, melon and mangoes are cultivated organically. 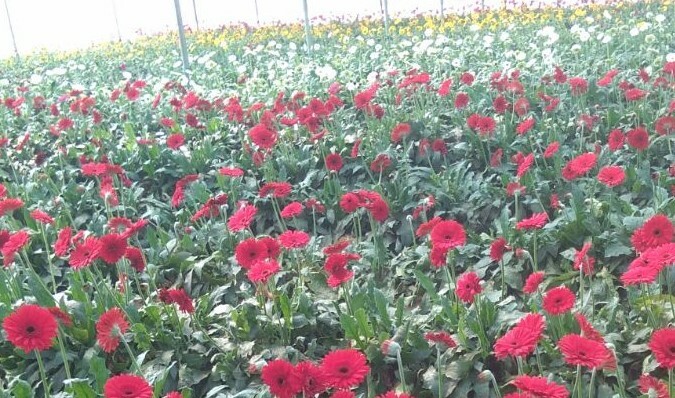 All the crops are grown in open cultivation accept gerbera that is grown in polyhouse covering 2 acre area. Livestock reared are desi breed of cow (herd size 20) and goat (herd size 40) along with rohu and catla fish. As it is a 100% organic farm, the farming inputs are prepared using farm and livestock waste. Mr. Gasu Mehta attained substantial increase in the farm revenues after growing vegetables. “Mine is an integrated farm but primary focus in on vegetables. It is so because after a close market watch I have observed growing seasonal vegetables is certainly more profitable than periodic farming of paddy and wheat. Vegetable market is consistent entire year and with crop rotation the soil fertility keeps getting replenished,” he highlights. Vegetables cultivated are capsicum, brinjal, tomato, ridge gourd, bitter gourd, cauliflower, onion, potato and garlic etc. Speaking on vegetable selection, he says, “I select the vegetables which none other farmer in vicinity grows. In this way it gives me an added advantage at the time of selling. Usually farmers are good followers as they just copy one another where as I take farming decisions independently based on the market demand and supply ratio. Besides, as I use desi seeds and do not use any trace of chemical inputs the production cost is less and quality of veggies is excellent therefore my farm produce either gets sold off from the farm gate or on the spot in the market within two hours. Also I fix the price Rs. 2-3/kg extra than the market rate even then selling is not a challenge.” It is same for sale of fruits too. There are three mango varieties grown in the farm namely Amrapali, Malda and Totapuri. “The trees are fed with farm yard manure in the month of November-December. It starts flowering by end of February and fruiting begins from April end onwards. I have noticed as my farm is totally chemical free the quantity and quality of mangoes is exceptional,” says Mr. Mehta. The plants and trees are nurtured with fish pond water, goat droppings and desi cows’ output. “I have locally found desi cow of our region. I don’t know the breed’s name but it had been intrinsic part of our family as long as I remember since my childhood days. It is absolutely a no-expense cow breed. As our farm is surrounded by forest the cows graze on the natural mix of medicinal herbs and green grass. We rear it purely for its dung and urine. Similarly the desi goat herd grazes in forest and is raised for its droppings. Of course the male goat (35-40 kg) is also sold for meat for an add-on income. We do not grow any food for the livestock. Being surrounded by the forest they live naturally and also we do not interfere with their growth process because we neither want milk from the cows nor look for weight gain of goats,” he affirms. Cow dung and urine are decomposed to prepare jeevamruth and pot manure (called matka khad in Hindi), goat droppings are decomposed using the decomposer (developed by National Centre of Organic Farming (NCOF), Ghaziabad). “Usually mangoes and tomatoes are prone to pest attack but in my farm pests and disease stay far away. Soil is healthy and nutritive rich so crops and trees have strength to resist all attacks. I find decomposer developed by NCOF to be most effective agri input for the plants. Within five days the manure using this culture is ready for spraying. All it requires is to mix 2 kg jaggery in 200 litre water along with the decomposer culture. This liquid bio-solution is then sprayed directly on the crops,” he elucidates. Apart from these farming inputs, fish pond water is sprayed in the farm through drips to augment the plant growth. There are two fish ponds in the farm, 75* 75 feet and other 100*100 feet in dimension. Rohu and catla fish are reared in these ponds. The fingerlings are bought at Rs. 400/kg. There are approximately 4000 fingerlings in one kg. 2 kg fingerlings each of rohu and catla are released in the pond in July. Commonly 30% is the mortality during the entire process. In the time duration of 7-9 months the fingerlings turn into table fish and sold at Rs. 150/kg in the local farmer market in the village itself. It is good source of additional income for the farm. Mr. Mehta established the polyhouse in 2015 acre with the capital investment of Rs. 10 lakh and received 90% subsidy. Rs. 10 lakh was additional cost incurred towards purchasing tissue culture plants and other miscellaneous expenses. 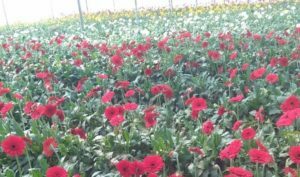 40 thousand saplings of 10 different colours were planted in 2 acre polyhouse. Mr. Gasu Mehta has proved that farming is lucrative if done without any use of chemicals and in an integrated manner. He now encourages other farmers to turn organic and focuses on youth farmers for the transformation. “With mass conversion from chemical to organic farming Indian consumers will have affordable access to healthy food and farmers’ pockets will be filled with money. Secondly it is only the farmer, who can increase his farm income by using desi breeds and seeds in the farm, setting up strong network and selling farm inputs in wholesale mandis, staying in touch with agricultural officers to get notification about the new agri schemes and subsidies etc. Stay alert, be inclined to change, work sincerely and attain success!” he signs out.